Do you sometimes find yourself struggling to find the perfect meal on busy weeknights? I will freely admit, I pretty much live by my pressure cooker and slow cooker since they both allow me to make meals the whole family love without a great deal of prep or time spent in the kitchen. The only difference is one I can’t really put off until the last minute (the downside of the slow cooker). Thankfully, I have my Instant Pot or Fagor Lux to save me if I need a quick, flavorful meal that nearly everyone will love. Best of all, I can make just about any recipe I can imagine, including chicken tacos! That’s right, I can make truly delicious, flavorful chicken tacos right in my pressure cooker. Best of all, they are made using ingredients that are staples of any kitchen (including the taco seasoning). Oh, and did I mention it is a fraction of the cost of chicken tacos you can get from fast food or your preferred Mexican restaurant? Yeah, they really are that great! I am honestly so happy my friend David from Food N Service shared this delicious recipe with me! 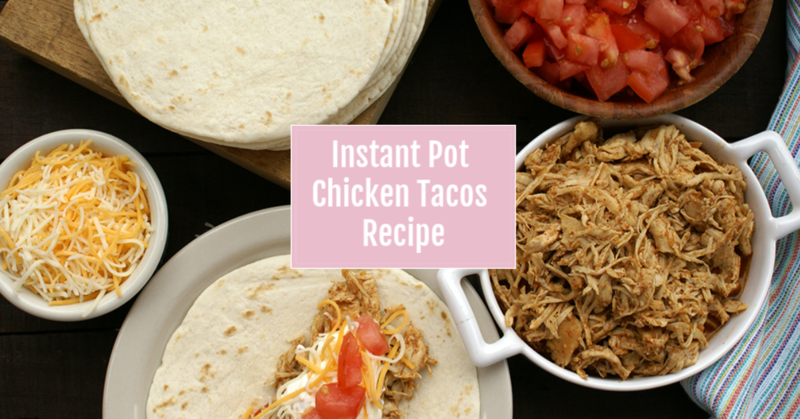 Are you ready to try our super easy and delicious Instant Pot Chicken Tacos Recipe? Just ready the recipe below and tell us what you think in the comments below! 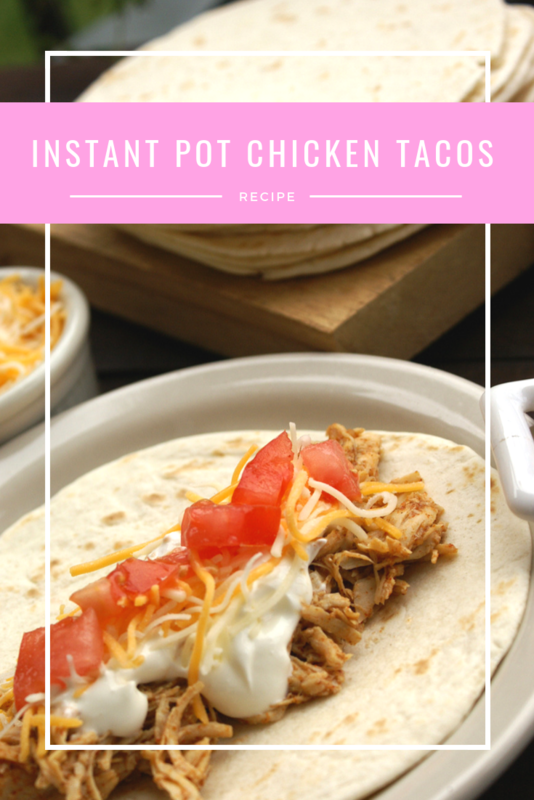 A delicious, very easy chicken taco recipe that can be made right in your electric pressure cooker! To make the taco seasoning, mix well and set to the side. You make this in batches. Place chicken, water, and 1 teaspoon of taco seasoning into your pressure cooker. Place on High Manual Pressure for 15 minutes. Let sit and slowly release pressure for 5 minutes, and then open the release valve. With a wooden spoon or metal tongs, break up the chicken breasts until shredded. Add remaining taco seasoning mix to pot and stir well. Place on sauté mode for 5 minutes to reduce liquid and reinforce flavors. Serve with your favorite toppings on a soft shell tortilla! We live Mexican and usually go to Taco Bell for a quick meal. This recipe looks yummy and my family would love it. I use my crock pot a lot also so this is great. Easy to make. Thanks for sharing. I love everything Mexican and these looks so easy to make! Going to try these next week for sure! We have never tried chicken in our tacos yet. It sounds good. Everything looks delicious except the flour tortilla since we have to eat gluten free doctor’s orders! Honestly is all looks good. I must get an instant pot. This recipe sounds delicious! These look super easy and delicious my guys would love them. My family loves chicken tacos! It’s one of our go-to meals during the week. This looks yummy! I wonder if it’d work in a crock pot? Looks amazing! I love chicken recipes and slow cooker recipes because I have 2 under 3 and that cooker is a life saver! This looks delicious, thanks for the recipe. I will have to add this to my must make list. 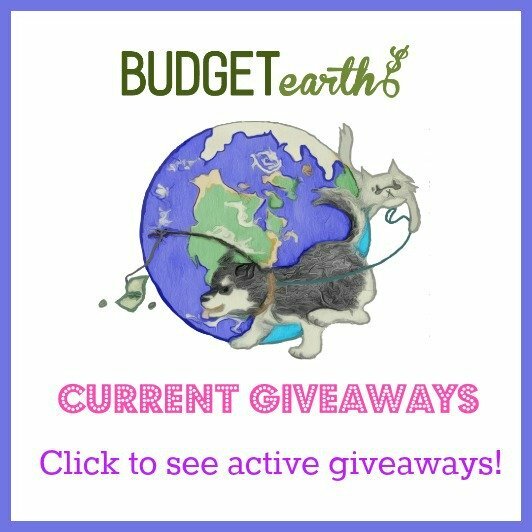 We love our instant pot and are looking for quick meals as we have a baby! This looks perfect! this recipe sounds yummy and pretty easy to make..thanks for sharing with us. I make my pork carnitas in my instant pot. 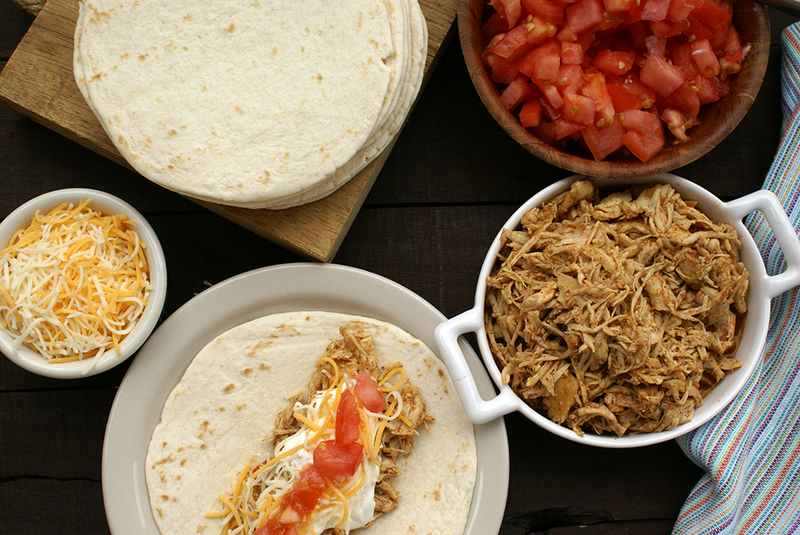 I’ve cooked chicken in it for other things – I hadn’t thought to make my chicken tacos in it. I might have to chunk the chicken instead of shredding, though. My husband is pickier than a little kid and doesn’t like shredded meat of any kind. Tacos are a favorite in my family and these chicken tacos look very tasty. I like simple recipes like these that always turn out to be good. What an easy recipe! I love Mexican food and this I’ll be adding to my Pinterest board. Thank you for this tasty recipe. We’ve never had chicken tacos before but these sure look good! They sound easy to make too. I have an electric pressure cooker that I could do the chicken breasts in. My family loves tacos, so will try making them this way for a change. That looks so good! I need one of these! This looks like a wonderful and tasty recipe to try. I would love an instant pot. WIll add this to my grocery list.. love taco’s and these look amazing! Thank you so much for sharing this recipe! I so need an instant pot! I have never tried to make it this way before and it looks pretty easy. Been hearing a lot about the Instant Pot these days. May just have to get one! That looks delicious. I need to try out those instant pots. love my instant pot – keep those Instant Pot recipes coming…btw, have you got a good recipe for pumpkin mac and cheese? I heard it is awesome made in the Instant Pot but having hard time getting the recipe. Such an easy recipe! We love using chicken in tacos, makes them a lot healthier. I like using chicken instead of beef in tacos, as well. This looks like an easy and quick recipe. Good job! I keep trying to avoid buying a pressure cooker, but this is making me reconsider. I’ve made chicken tacos before, but I never seem to get the spices right. I’ve resorted to buying pre-packaged taco seasoning, and it’s just not as good (it’s a lot of salt). I read this recipe and realized I’ve been forgetting garlic!!! UGH! But now I know so hopefully my next ones will turn out better. I’m still new to using my Instant Pot. 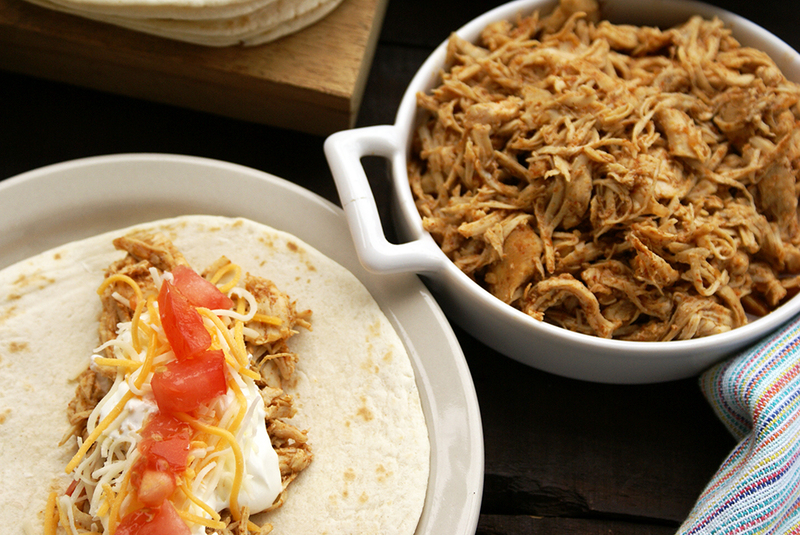 You can’t get much easier than tacos so think I can perfect this Chicken Taco creation. It does look tasty. Anyone else remember the episode of “Will & Grace” when Karen and Grace go to Taco Time? Your recipe looks just like the show. This would be perfect to make when the show comes back in September. This looks amazing, so delicious! and I love how fast it cooks in a pressure cooker, wish I had one. Great recipe. I’m glad you included the taco seasoning ingredients – I always prefer that over the seasoning packets. Such an easy recipe that everyone is sure to love! Holy moly do I love me some tacos!! This looks good and I’d like to try it in my new pressure cooker. I do have one question though. Are most pressure cookers like slow cookers where the timing is about the same? I have one that is a different brand than yours, would the timing be similar? Yes. Timing on all the recipes are the same. 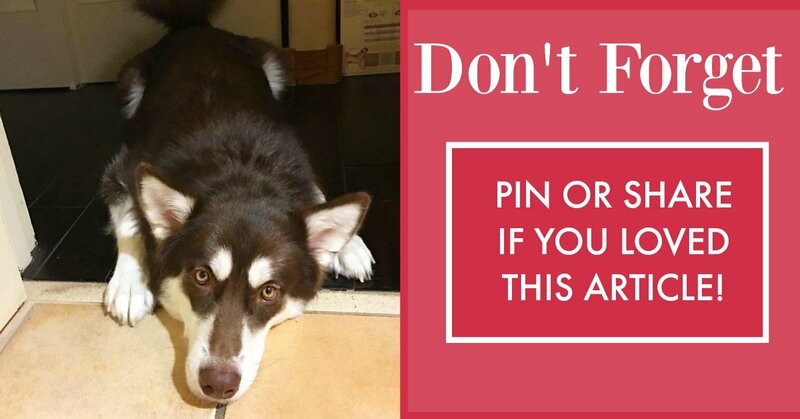 I have two pressure cookers – a Fagor and an Instant Pot – both cook in the same amount of time. I’ve been wanting an instant pot. This is just another reason why! I make slow cooker taco meat like this but to be able to do it in 15 minutes!! Wowzers! what a great idea!! we have lots of taco nights, and this would save so much time!! Two favourite foods in our home: Italian & Mexican! So I know this recipe would be welcomed here – YUM!! Oh this looks soooooooooooooooooooooo good!! AND I have everything I need to make it! Can you say this is supper tonite!! Whoohooo!!! Looks so good for my evening of television. A nice Southwestern delicacy, with a twist of old world taste. Thanks so much for the directions on making this. This looks so much better than fast food! Thank you for the fantastic dinnertime idea. I really want an Instant Pot! wow i didnt know you could do all that in a instant pot. ineed an instant pt in my life . I just got an instant po I need to start cooking with it. Thislooks good. Nice looking recipe. Can’t wait to make it. I’ve seen so much about the Instant Pot over the last year. It looks like it can be a real time-saver. I have always wanted to try a recipe like this. I’m going to try it. Saving it on my Pinterest. Just got an Instant Pot for my birthday. This recipe will be tried very soon. Thanks for sharing. These look quit good. I like how easy this sounds. I just got an IP and havent used it yet, I am a bit intimidated. These sound easy enough for me to try them. I adore my pressure cooker and actually have never made chicken tacos so this recipe sounds like one I need to try, saving the link to my bookmarks. Thanks for sharing. I got an instant pot for Christmas. This recipe looks easy and tasty; I should try it! I am going to try this tonight. I have all of the ingredients and was planning on chicken breast tonight. I love chicken tacos and this recipe looks and sounds great. I can’t wait to try it out. I have a slow cooker and think I can make them using it. As a single mom, I’m always looking for easy and yummy recipes to make. This looks like it will fit. I can’t wait to try it! Thanks!! This does sound really good, and we haven’t had tacos in a while. I’m going to realize I can’t get by without an instant pot! Yay! I love instant pot recipes! I love that you made your own taco seasoning mix, instead of using store bought mix that can contain some unhealthy ingredients. This looks super easy to make. My family loves tacos, so I will try to make this soon. This is sure to be a hit with my two little sisters. They practically live on Mexican food! I can’t wait to pair this dish with cool, crisp tomatoes and lettuce! I bought my instant pot over a year ago… and still haven’t used it. I’m terrified of it, lol! This looks really good though and maybe it’s time to give it a shot.